Barbara La Marr candidly confessed that she loved to live because she lived to love. “No woman,” she insisted, “who has not known love can have a soul.” She shamelessly declared that she liked her men by the dozen—like roses, she said—, and she wed nearly half as many in her passion-filled, heartbreak-laden life of twenty-nine years. as a moonless summer night! were clear and grey, and searching! Well, Billy had a sense of humor! BECAUSE—His was red—too red—and just a bit cruel! “No woman who has not known love”: Ferguson, Helen, “Unquenchable Ardor, Pitying, Wise—,” Motion Picture Classic, May 1924, pg. 76. “I’ve always been in love”: La Marr, Barbara, “My Screen Lovers,” Photoplay, November 1923, pg. 63. This entry was posted in Barbara's Poetry on July 28, 2015 by Sherri. 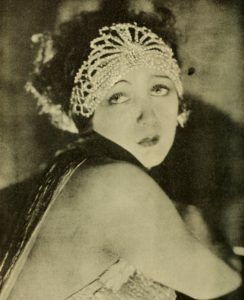 At the height of her fame in 1924, Barbara La Marr reportedly earned the modern equivalent of over $30,000 per week as a reigning vamp of the silent screen. Never far from her heart, however, was an inherent compulsion to express herself through the written word. She first put her thoughts to paper as a young girl, composing little verses and short stories. As a young woman, her inner musings took the form of poetry, pouring from her, she said, when she was so consumed with emotion that she just had to have an outlet. 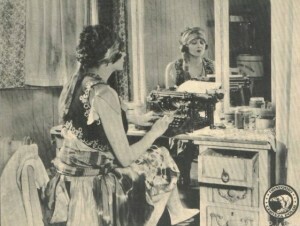 Her very first full-length story caught the attention of Winfield Sheehan, general manager of Fox Film Corporation, and won her a contract with Fox in 1920. Fueled by her incredible life experiences, Barbara ultimately penned five original stories and one adaptation for Fox. She put her writing talents to further use crafting intertitles for Fox films and, later, by doctoring scenarios for other studios’ films in which she played starring roles. All the while, poetry remained her favorite medium of literary expression; to her it was “the freest of the free.” When not before the camera, Barbara sometimes sat on the sidelines of film sets, transcribing her heartfelt feelings into verse and scribbling story ideas. 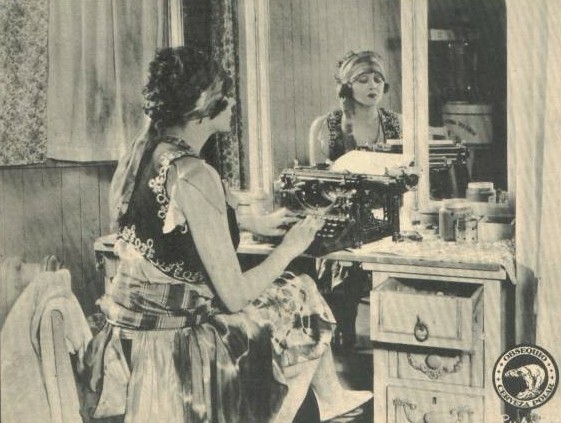 She vowed to one day return to her typewriter, when her career as a film actress had “gone by with the glories.” Sadly, her tragic, untimely death in 1926 at the age of twenty-nine cut short her aspiration. The six films Barbara wrote for Fox have yet to be located by film preservationists. For now, her writings live on in her poetry. Three of her poems, written before the breakdown which resulted in her death, appear below. Why should I speak to you of HIM? Of loves I have left and loves returned. Dreamed of that which I have never had. Your willful, reckless, tender lies. To filmy ashes of golden dust. To me, a futile one. This entry was posted in Barbara's Poetry, Barbara's Screenwriting Career on July 28, 2013 by Sherri.